Young children love asking “how” and “why” questions almost as much as they love flipping through lively and colorful picture books. 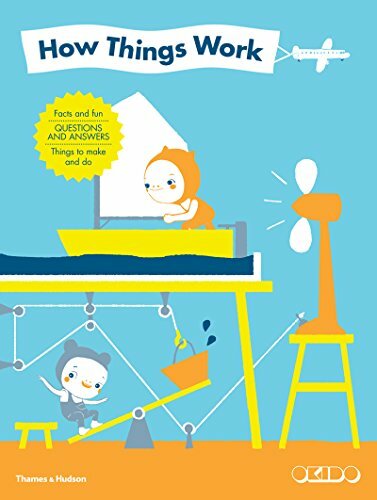 For this reason, How Things Work: Facts and Fun, Questions and Answers, Things to Make and Do by Okido may be the perfect activity book for inquisitive young minds. This is an action-packed, oversized picture book reminiscent of the over-stimulated days of yesteryear when any- and everything a child encountered was fair game for his or her inquisitive mind. It’s also a book that attempts to make everyday learning simple, fun, and, apparently, nonstop. It uses “guides” named Koko and Alex to lead children through a barrage of themes and activities. For example, the opening theme called “At Home” includes activities like identifying what types of homes people and animals might have and discussions on how homes use energy every day. Children are also encouraged to conduct all types of “home” experiments, like how turning lights off and on conserves energy. Other themes and their corresponding activities include everything from learning about water, experiencing how a book is made, and understanding what a machine is and isn’t, to understanding electricity, exploring musical instruments, and playing with shadow puppets. This ambitious picture book attempts to answer questions and spark imagination about virtually every object that may be found in a child’s immediate surroundings. The book’s meticulous, nonstop artwork is childlike and simple, with large, innocent eyes and sweet smiles that are reminiscent of artwork that might be produced on a lazy Friday afternoon in an early elementary classroom just before the final bell rings.